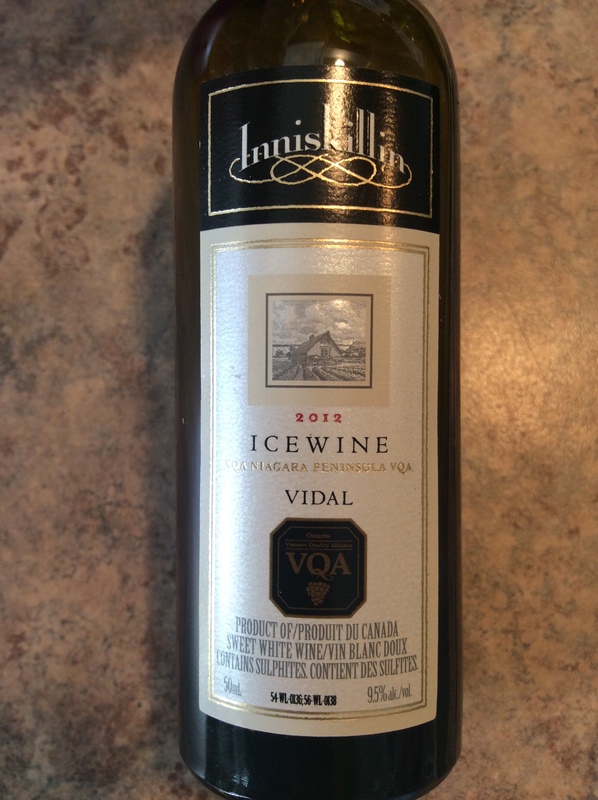 One of the treats to myself from the Christmas season, I purchased a few mini-bottles of the 2012 Inniskillin Vidal Icewine. I opened this young Icewine for the most recent Ontario Wine Chat on Twitter. I am a huge fan of Icewine in general, usually the aged variety, so I decided to open a younger one to see how it compares to the aged versions I have opened recently. The colour was light golden yellow, much paler than the deep golden colour that most aged Icewines are. The nose was bright and lively with a definite sweetness of preserved lemons and candied pineapple. With a silky unctuousness and gently cloying (in a good way) mouthfeel, the flavours were a replay of the nose with lemon marmalade and pineapple preserve. A welcome change to the aged Icewine I usually open, the youth and vibrancy of this delicate nectar was enjoyable from the first sip to the last. 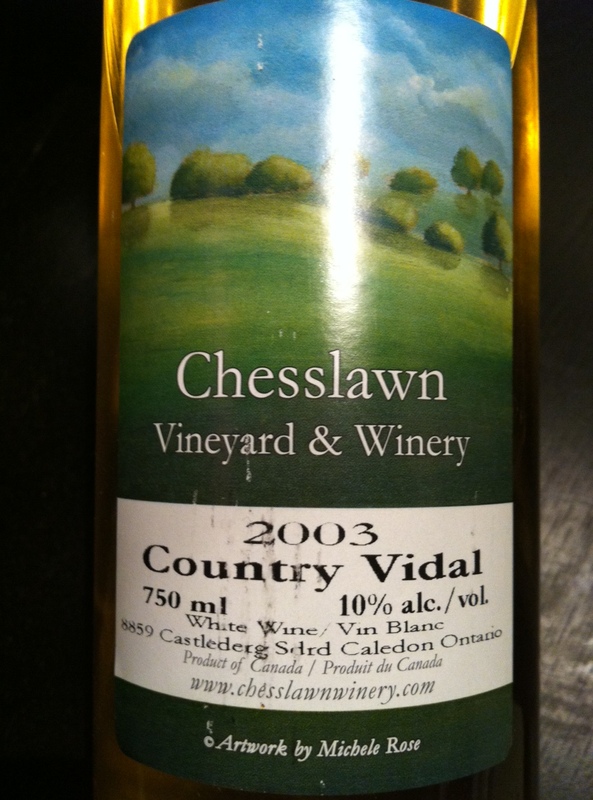 Wednesday night is Ontario Wine Chat on Twitter (#ONWineChat) and I decided to go local with a wine that I have been saving to see how it would age, a dry version of Vidal from Caledon’s own Chesslawn Vineyard & Winery from their initial 2003 vintage. Thankfully I had two bottles left in the cellar as the first one was somewhat…interesting. So begins The Tale of Two Bottles. I am quite familiar with the ice wine version of Vidal and have tried many different producers and vintages, both young and aged. I tend to prefer the aged ones with the secondary and tertiary aromas and flavours that emerge. I tried this dry Vidal when it was young and enjoyed it for the pure citrus fruit and zippy acidity. Eager to see what had happened with a decade of bottle age I opened it and poured a glass. What a beautiful colour of golden yellow and with the first sniff….WOW! Slapped (or more aptly punched) with the pungent aroma of used litter box. Okay, maybe this needed a little time to “open up” after being asleep so long. Unfortunately the litter box turned to mouldy lemons and slightly rotten raw ground beef. I had to see what this would taste like and astringently sour turpentine flavour confirmed that this bottle had failed somewhere in the aging process. You may be asking yourself “Why would he taste a wine that smelled like litter box and rotten lemons?” I have tried many a funky smelling wine that turned out to be golden pleasure in the mouth, usually Sauternes. 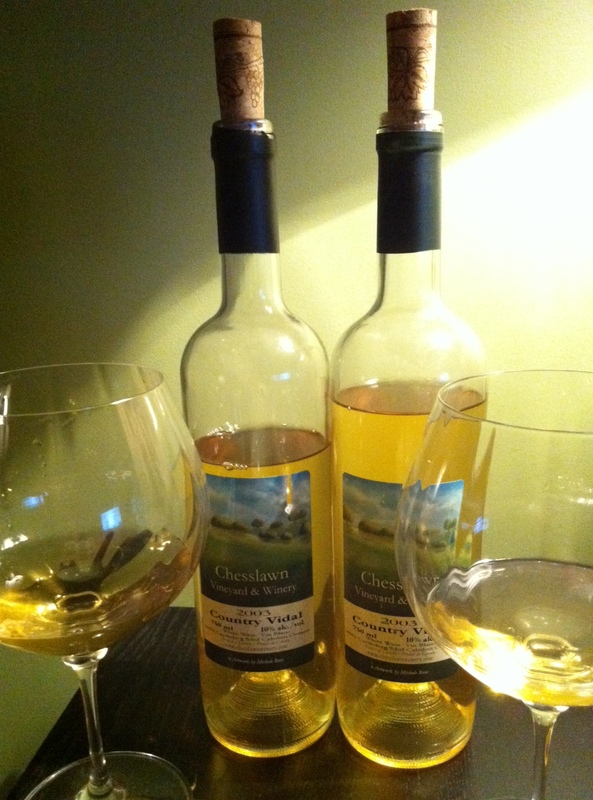 I once made a pact with a friend of mine when we tried a garage-aged Pelee Island Gewürztraminer. If you are going to taste wine, you have to actually taste the wine, no matter what it might smell like. Even if you end up spitting it out you at least have to put it in your mouth. Not to be defeated with an off-bottle I opened the last bottle of 2003 Country Vidal to see if it faired any better. With just a little trepidation I inhaled and was greeted with lime pith and lemon zest and with time a slight butterscotch tinge. These aromas were replayed on the palate along with tart green apple and absolutely zero sweetness. This bone-dry approach to a varietal that is often used in ice wine production was a very intriguing juxtaposition. I am glad I had a second bottle to open. I wish I had a couple dozen oysters to open along with it. James Pallister Sales Representative Re/Max West Realty Inc.